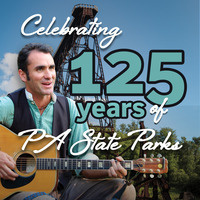 Van Wagner Celebrates 125 years of Pennsylvania State Parks! Join Van Wagner for a special, one-hour performance of storytelling and music that commemorates the 125th anniversary of state parks. Trace our heritage of restoration, recreation, conservation, and family fun as we reflect on how Pennsylvania’s citizens were instrumental in the establishment of state parks. This performance is part of our annual Fall Festival so consider expanding your visit to include the multitude of was to celebrate the season.